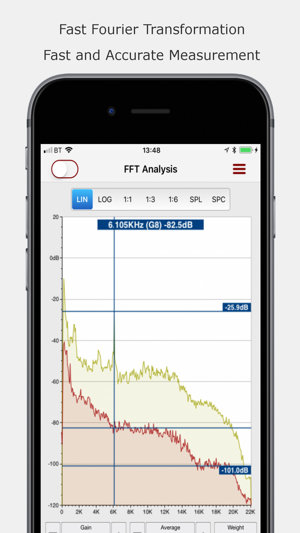 Audio Toolbox is a suite of audio analysis tools for the iPhone and iPad. It comprises both audio waveform generators as well as a highly accurate Fast Fourier analysis engine, an audio oscilloscope and various frequency detection and tuning tools. 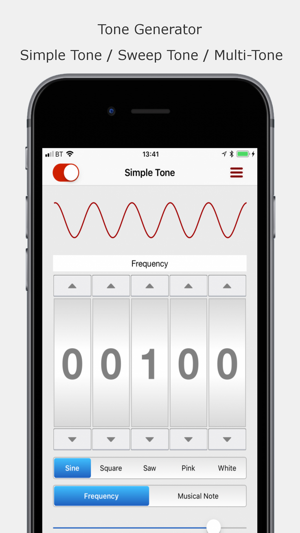 The Tone Generator allows you to create anything from a simple sine, triangle, square, or sawtooth waveform as well as white and pink noise. It also supports log and linear sweep tones with definable range and level and complex wave construction using sine waves. The later is great for teaching audio theory with its DTMF and complex tone generation tools you can build complex waveforms and then analyse their component parts using FFT and the oscilloscope. Build DTMF, triangle, square or saw waves using multiple sine waves etc. The Audio Oscilloscope allows you to analyse directly from the tone generator or microphone. The scope features both free running and single shot modes with adjustable triggering options. The single shot mode automatically starts and stops capturing when short bursts of sound exceed a threshold. The oscilloscope also features a simple measuring tool to help measure duration and frequency of a waveform. 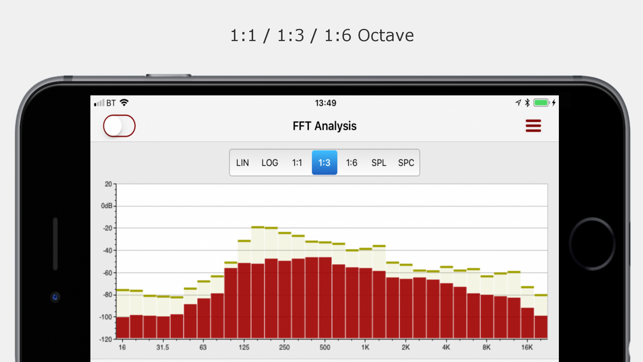 The FFT Analysis section provides both Linear, Logarithmic as well as 1:1, 1:3 and 1:6 Octave modes. There is also an SPL meter complete with LEQ options and A/C weighting, log and linear Spectrograph and Mixer EQ modes for setting up audio mixers. All screens support 10x zoom, full screen and pause modes to aid analysis. 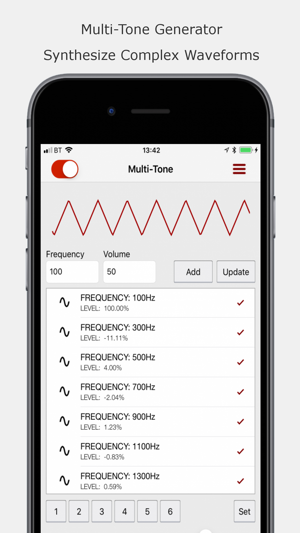 There are also specific modes to detect peak frequencies, musical notes with cents offset, perfect for instrument tuning. Definable calibration tuning allows you to tune +/- 40Hz. •Sine, Square, Saw, Triangle, Sweep and MultiTone options. •Accurate 8K Fast Fourier Analysis. •32bit / 44KHz floating point audio sampling. •Standard ANSI/IEC A and C weighting curves. •Automatic peak note / frequency and octave display. •Narrow band Linear and Logarithmic scalable displays. •Spectrogram display with Log and Linear Modes. •1:1, 1:3 and 1:6 octave display modes. •1:1, 1:3 and 1.6 Mixer tuning modes. •SPL (Sound Pressure Level) display. •Max, Min and Peak level capture. •LEQ Mode (Equivalent Continuous Sound Level). •Touch screen display of nearest point with frequency and decibel readout. 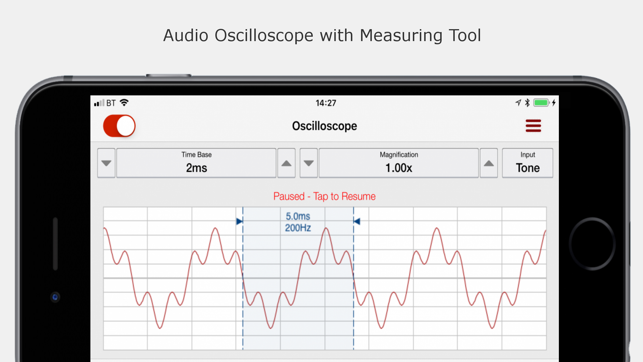 •Audio Oscilloscope - Free Running and One Shot modes. •Definable trigger (leading and trailing edge). •10x zoom and full screen modes. •Pause facility freezes the live trace to aid analysis of data. •Export and Email CSV data from FFT or Scope. •Built in web server for transferring files. •Capture peaks over time facility. •Works on both iPhone and iPads. Solved the issue of glitchy audio on iOS12 on first launch.